Ok, flipping through the unofficial that I have, I think this picture clearly shows my TQ tag. At first, I made a sort of colorful tags. Ade flowers2 n bingkai2..but i forgot that my printer xde kale T_T..huhu..so, I came out with something like above. Actually, when u sees it nearer, there's background on it. shining underneath the words (konon2..). 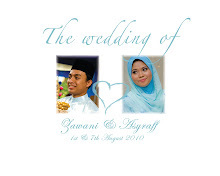 So, I guess okla ni..hihi..For solemnization, I changed "...The Reception" to "...The Solemnization". For my bekas telur, I did a mini version of the tq tag. However, I didn't have the chance to snap the picture of it. Huu..Dear friends, if you guys ever received my bekas telur, can you please snap the pictures of it and e-mail it to me T_T thank u.. Eventually, I was so particular about tq tag. I alwiz go checking on the tq tag whenever I went to a wedding. Even the tq tag was made of an a4 paper, as long as it personalized, I will surely take the photo of it. And usually, the personalized words connect to me more. So, this is one of the small things that cared for in a wedding.